IPA DRAM Organisational structure includes the Steering Committee as the decision-making body of the programme, a consortium Coordination Group to facilitate the work of the consortium, a programme management Team and an Expert Team to implement the programme activities. Included are also the two-tiered National Working Groups established in the partner countries which will participate in project planning, implementation and follow-up. The Steering Committee (SC) has an overall role to support and supervise the implementation of the programme through giving general direction and concrete advice. 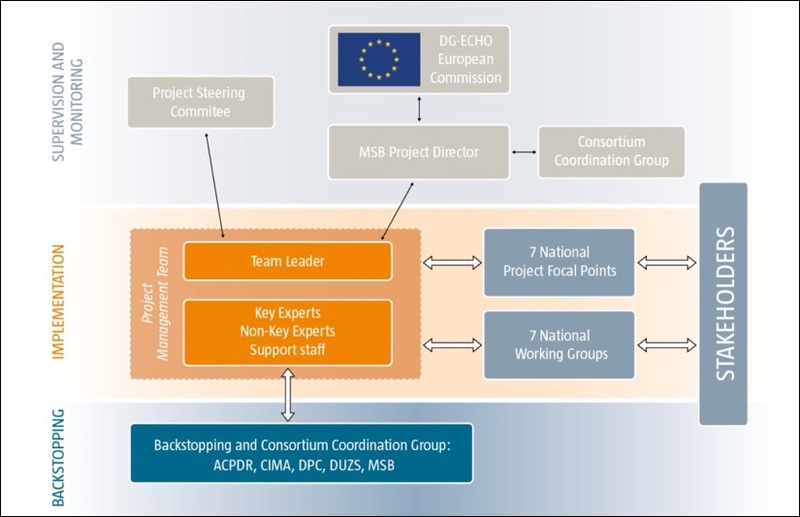 The SC will include two representatives from each partner country, representatives from the Joint Research Centre of the European Commission, the regional Cooperation Council and the Disaster Preparedness and Prevention Initiative for South Eastern Europe (DPPI) and representatives from the consortium members. IPA DRAM also intends to invite experts from a broader spectrum of countries in or outside EU, and representatives from organisations to take part to the Steering Committee. It is composed by the Programme Director Ms Hanna Norell and staff from the administrative, financial as well as human resources departments. A regular dialogue with the EC as well as the Steering Committee will be upheld to ensure a good flow of information and efficient consultations. The key expert team has been selected based on their excellent qualifications and skills, and with their specific experience in the region of the Western Balkans and Turkey. The technical key experts are both considered to be at the forefront within their respective fields, and also bring with them considerable regional experience as well as substantial experience of working on EU projects.